Christopher Paolini, the young author of Eragon, an award-winning fantasy about a young man who finds and raises a dragon, has been living a fantasy adventure every bit as exciting as his novel ever since he sat down at his computer seven years ago to write something that he would like to read. Like most epic fantasies, the story of Eragon follows the familiar storyline of an ordinary youth who is sweptd away from his obscure village by events beyond his control. After he finds a dragon egg, the peace and security of his home is destroyed and he is forced to turn to new friends to escape and prepare for what lies ahead. Eragon finds a mentor in the village story-teller, Brom, who turns out to be the last of the Dragonriders. Together they raise Saphira, a beautiful blue dragon who forms a telepathic bond with Eragon. The elf Arya, who is charged to protect Saphira, teaches Eragon magic. Together, Eragon, Arya, Brom and Saphira face great hardships, perils, and personal challenges. The story climaxes in an epic battle between the evil King Galbatorix with his corrupt Urag forces and the valiant, freedom-loving, Varden warriors. The story is as old as time itself. It has been told in a thousand tongues under different names, with different settings, and characters. There is an unsure youth, the loss of family, a long journey, a trusted mentor, a magical friend, a powerful weapon, supernatural enemies, a test of courage and loyalty, and a battle to save all that is good. Whether it is an ancient myth, Arthurian legend, Kung Fu movie, medieval fairy tale, comic book, Lucas film or Tolkien epic, the stories are the same, and we love them that way. The reason is that it reflects our own heroic transition from childhood to the full strength and power of adulthood. Nearly everyone of us has been through a time when we were suddenly awakened to a new world filled with real danger and amazing oportunity where we knew that it was now up to us to make the magic happen! Though the story is old, Paolini infuses it with a new sense of possibility and awareness. He pours every bit of wonder and dread that an adolecent feels into his writing. Paolini told USA Today, "Eragon really is just my daydreams, stuff I wanted to be doing like running around fighting monsters and rescuing beautiful elves". He is most proud of the relationship between Eragon and Saphira. Their connection is beyond that of a boy and his dog, or a cowboy and his horse. It combines all that with the passion a young pilot has for an airplane he has built with his own hands and a very personal love story. There is no other relationship quite like it in fiction. 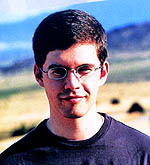 Christopher Paolini grew up in a house 20 miles from the nearest town in the Beartooth mountains of Montana that didn't even have broadcast television until he was almost grown, so he developed a love for epic fantasy novels at a young age. He was homeschooled and recieved his high school diploma at the age of only 15. Since his father thought that he was too young to go away to college or get a job, he took a year to pursue his interest in writing. He wrote everyday without showing anyone his work, not even his parents. At 16 he finished the first draft of the book then spent another year reworking it until he was confident enough to call it done. 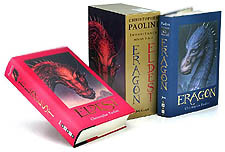 His family was delighted with the work and together they decided to make a project of self-publishing Eragon. They printed a few hundred copies and began travelling around the west promoting the book through libraries, schools, and bookstores. Never selling more than a few dozen copies at each place. By October of 2002, it became apparent that self-publishing was harder than expected. It took a long time to recoup the costs of printing and with the loss of regular income, the family was about to go under and give up the dream. Little did they know that another author, Carl Hiaasen, had bought a copy of Eragon for his stepson while on a vacation in Montana. Hiaasen loved it so much that he sent a copy to his New York publisher. Within days, Michelle Frey, an editor at the Knopf imprint of Random House Children's Books emailed Christopher to say that Random House wanted to publish the whole Inheritance trilogy and give it a nationwide roll-out! The book went through another round of editing and rewriting before it was published in August of 2003. Before the month was out, Eragon debuted at No. 3 on the New York Times bestseller list! In what felt like a twinkling, Christopher Paolini was flying around the world giving interviews, attending booksignings, and meeting with adoring fans. In 2005 the second volume, Eldest, debuted with an initial print run of over 1 million copies. At 15, Paolini had a hard time imagining sharing his stories with people in Montana, much less the millions of young people who would one day become fans. But less than five years after he finished high school he was being compared to Harry Potter author J.K. Rowlings. Like Eragon, Paolini found his blue egg while hiking in the mountains. It hatched into a trilogy and with the help of others along the way, it grew into a magical creature that has carried him to places and heights that he never could have imagined. The word spread quickly and Hollywood noticed. 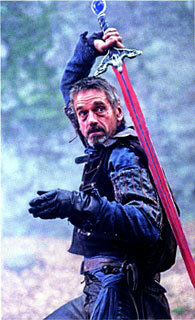 Fox made a good offer to aquire the movie rights and in 2004 Eragon was on the fast track to a major movie production. Fox cast three legendary actors in major roles, Jeremy Irons as Brom, John Malchovich as King Galbatorix, and Djimon Hansou as Ajihad. The role of Eragon was still uncast though the hunt was on for the perfect unknown actor. For months Fox pictures held auditions in Los Angeles, Toronto, Vancouver, Sydney, London and other cities. With time running out they worried that they wouldn't find their Eragon until Edward Speleers walked in. The seventeen-year-old from Chichester, England had that indefinable quality that they had been seeking. 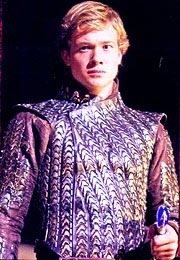 Unlike his veteran costars, Speleers had only acted in a few school plays before he was cast in the title role of one of this year's largest films. Speleers, like Paolini, went from relative obscurity to international fame in months, but not without facing many trials and adventures during filming. The movie was filmed in the mountains and forests of Hungary and getting to work each day often proved difficult. It rained for two weeks in August turning every road they had built for the equipment into mud. Speleers had to do many of his own stunts like ride a horse, swordfight and swim through a thundering waterfall. For costuming purposes he had to endure a full body cast, an experience that is confining and uncomfortable to say the least! For the flying scene he had to ride a motion-rig which was like a large mechanical bull. It could be programmed to repeat it's moves exactly take-after-take. Speleers describes it as a diabolical theme-park thrill ride. For many of the shots he was strapped into the saddle while wind and rain machines lashed him mercilously in the face as the cameras roled. Irons felt a special bond with Speleers, " He is only a bit younger than my youngest son, and Ed actually reminds me of him a lot. Ed has an enormous charm and intelligence and looks wonderful on camera. [He's] Every thing you want an actor to be. He's a natural." The feeling is mutual. "Working with Jeremy was great, All the way through he nurtured me and gave me advice." Speleers says of his mentor Irons, "I'm sure he was doing it out of his own heart, but at the same time, there was so much of Brom in him." The film opens December 15th in theaters everywhere. View the movie trailers here. 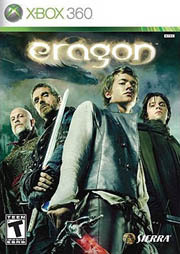 Stormfront Studios, the makers of the popular NASCAR series, and Vivendi Universal, have created an action-adventure game from the characters and situations in Eragon which will be released November 17, 2006. This game lets you fulfill your destiny as a dragon-rider to save the land of Alagaësia from evil King Galbatorix. Experience breathless dragon flight and unleash devastating attacks on your foes with your magic powers and skillful battle moves. A second player can join the game at any time for true drop-in co-op play. In the Microsoft Xbox360 version there are two additional levels to further explore the epic events in the book and it is Live Xbox aware. Rated T for Teen, with blood, violence, and mild language. The game is in Dolby 5.1 Surround Sound and HDTV 1080i for an incredible sensory experience. View a video about Eragon Video Game. If you have a 2-way text messaging wireless phone and digital service you can enter the Eragon Mobil Scavenger Hunt. Just text "HUNT" to "20FOX" and follow the instructions. Prizes include $1,000 cash, Eragon games from Vivendi Universal, book sets from Random House (with one signed copy of Eragon and a copy of Eldest) and Eragon collector's cups from Mountain Dew.